Despite both Jon Anderson and Rick Wakeman having extensive successful solo careers stretching back to the mid-seventies both men will probably forever be associated with the classic line -up of British rock band Yes, and throughout the seventies and for various periods in the eighties, nineties and beyond both artists enjoyed a fruitful and hugely successful working relationship as part of Yes. The duo, however, have worked together outside of Yes performing in the UK in 2006, both classics from the Yes catalogue and also selected items from the pair's individual solo catalogue. In 2010 it was announced that Jon Anderson and Rick Wakeman were to tour together once more, with the tour taking place at the end of the year. The tour featured material from their time with Yes but more importantly, material from the duo's then new album The Living Tree. From this tour a compilation of live highlights was overseen by Jon and Rick. The live album features songs from The Living Tree, including Just One Man, The Living Tree part 1, 232411 and also a selection of Yes classics including And You And I, Time And A Word and Long Distance Run Around. There is a massive audience for both Jon Anderson and Rick Wakeman as solo artists but as artists universally connected and associated with Yes this live album will be hugely anticipated by the strong Yes fan base. 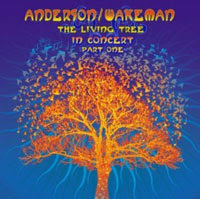 Not too long ago Anderson and Wakeman presented us with the excellent "The Living Tree." Since then, they've taken this project out on the road on both sides of the Atlantic. This release documents the concerts, and shows what went down on stage. Right away, the listener is experiencing the very laid back nature of the concert. Both performers are in a very fine shape artistically. They play around with the songs, and really draw out a variety of the material. Both men were in Yes, so of course, there is a fair dose of the Yes tracks. And it's really great how they rearranged these songs, so they fit the overall format of the show. The Yes material and Anderson/Wakeman tracks are very naturally linked by their co-creators, making it a very enjoyable live recording. The duo even dust off "The Meeting" from their Anderson, Wakeman, Bruford, Howe collaboration from 1989. A very impressive album, that helped to re-establish the 70s version of Yes in modern times. "23/24/11" still steals the show, and that is just such a fine track off "The Living Tree." It's as good in the studio as it is on stage. "Long Distance Runaround" is another great stand out tracks from the past, and the duo gives it a very nice semi-acoustic treatment. And who could forget the reggae rendition of "Time And A Word," with a good measure of The Beatles thrown in for your enjoyment. Anderson/Wakeman is a very natural connection. The live performance has a very organic feel. And it's unbelievable what you can accomplish only with two players. Considering this is only part one, there should be at least one other live set to follow. Also, let's hope this duo will continue to make music in time to come.